EXPLORE YOUR UNIQUE SOVEREIGNTY WITH THE LUNAR ‘QUEEN’ DEITIES & THEIR CYCLES! Ticket Cost: $150 (plus booking fee). Scroll down to book on-line. Walk gently in the footsteps of the Gods and Goddesses in the very place that created the term ‘mythos”. Hellas, the ancient term for Greece, is a place of unparalleled archaeological and mythic importance. Zeus and Hera, Artemis and Apollo, Athena and her owl, Dionysus and the Muses, Poseidon and his sparkling oceans, Hades and Persephone in their underworld, Gaia and her snowy mountains: here, all come alive in a tapestry of magic, nature and mythos. As with all Wild Souls Retreats, you won’t be inactive, instead, like the ancient pilgrims, you will renewed be journeying through the ancient city of Athens, to swim in the sea right by Poseidon’s own temple, to the sacred heart of the ancient world Delphi, and onto the very home of the Gods and Goddesses, Mt. Olympus. We will relax, learn, connect, and perform ritual in some of the most powerful sacred sites in the ancient and modern world. We start our sun-soaked journey in the Hellenistic capital of Athens, where we start spectacularly with a walk, ritual and visit to the world famous Acropolis. We enjoy expert insights from an archaeologist and expert on culture. Then our adventure starts proper- the next day we swim with Poseidon and receive blessings in his temple. In days to come, we travel inland into the sacred highlands to Delphi and learn about the Pythia and her oracle and perform rituals dedicated to Artemis and her twin Apollo on their actual temple site. The home of the Gods and Goddesses, Mt.Olympus, receives us next and we hike along the wild gorge paths in one of the most spectacular places in the whole of Hellas. And all the while we experience the food and hospitality Greece is famous for. All your breakfast, lunch and dinners are included and deluxe accommodation in which to rest your head. If you have ever wanted to experience the real magic of ancient Greece, here is your opportunity. What’s included in your Wild Souls Greece experience? – 10 day/ 9 night programme. 3 nights accommodation in the elegant The Margi in the Athenian Riviera, Vouliagmeni, Athens. 2 nights accommodation at the Amalia Delphi. 3 nights at the Royal Palace Hotel and Spa in Platamonas, near Mt Olympus. 1 Night Accommodation at the Amalia Hotel, Athens. – Your Meals: Nourishing meals from our first evening in Athens through to our last breakfast in Athens. Our meals will be Greek style mostly, fresh local food, and please discuss any dietary requirements with us. As always on a Wild Souls Retreat, we immerse ourselves with the natural environment and the people who live there. As we will be travelling within Hellas to both urban and remote areas, we have the services of experts and guides who will assist us to get the most out of our visit. – We start with an early morning visit to the Acropolis which towers high above Athens city. We will do ritual here and set the intentions for our journey on the very hill that has held ceremony for countless millennia. We will then visit the stunning new Acropolis museum. The museum displays some of the most impressive and precious ancient Greek artifacts and sacred art. A qualified archeologist guide who has taken part in major Greek excavations will accompany us. – As we see more of the city, we will learn about the evolution of the theatre and dramatic arts from a specialist speaker from the Greek National Theatre. -We will travel to Sounio to visit the Temple of Poseidon and swim at and do ritual at the beach honouring the God of the Sea, earthquakes, prosperity and flow. -Travel to the Omphalos (navel) of the World, the centre of the ancient Universe, Delphi. We will visit the Museum and spend two days at this incredible area. Here you will visit the home of the famous Delphic Oracle who gave insights to King Croesus and Alexander the Great. You will walk the ancient path from the Cave of Panas (Corycian Cave) up to Delphi itself. Perhaps the most famous place of power in the whole of Greece, the profound energies of Mt. Parnassus can be experienced with love and devotion. Parnassus is home to the God Dionysus and the Muses so we will ensure we have some fun in the evening! – Perform Artemistic ritual with Stacey in the actual Temple of Artemis and make offerings to her brother Apollo, the God of Light and Music, in his home in Delphi. – Visit and explore the home of the Gods, at the foot of Mt Olympus. We will travel to the village of Litchoro, on the east coast of Hellas, to see where Zeus and the Olympians make their home. For two days we will stay amongst the mountains and the deities. We will visit the Dion Archaeological site as well as pay our respects at the large Temple of Zeus. There are also sacred temples to Demeter, Isis and the Greek God of Medicine Asclepius. – Experience the beautiful yet slightly challenging Enippeas Gorge Walk on the site of Mt. Olympus the way the ancients did, by foot, leaving small offerings and singing to the Gods! -You’ll honour the Gods and Goddesses at a dawn ceremony over the Aegean Sea and visit the archaeological site of Aigai, the first capital of the Kingdom of Macedonia. Here we see the royal tombs of Alexander the Greats father Phillip II, who paved the way for the incredible expansion of the whole of the Hellenistic world. – Our last afternoon and evening will be spent back in Athens and our farewell dinner will have a view of the shining Acropolis. Full circle! – All transport is included during the retreat, including chartered private bus. – And of course, a mythos-rich spiritual programme with Stacey. This retreat will involve ceremony and rituals on the sacred sites of the Gods and Goddesses. Stacey will also be teaching the traditional way, “in situ” (within the places) and so you will be learning about the mythos, concepts and doing the transformational workings within the actual places that have harboured this energy for literally thousands of years. Nature, as always will be your teacher too, and will work it’s magic to bring you back to your most authentic self. The sea, the sky, the earth, the fire of the sun and the air of mountains will transform you. This retreat is designed to quickly clear away the everyday, inspire your spirit, connect you with your own continuing mythos, spark your innate creativity and to bring new flow and vitality to transform yourself. With this retreat, you will be doing quite a bit of ritual and energy work, and whilst this is optional and you need no experience, you should be open to the workings and the earth-honouring learning to get the most out of the retreat. –	Transport from the airport to the meeting place in Athens, the Hotel Margi, and your transfers back to the airport on the last morning. –	Any activities on your free days or afternoons. –	Tips and items of a personal nature. As always, you will be supplied with an extensive packing list and further details well ahead of time and of course the useful and beautiful gifts you have come to expect. This retreat requires an average fitness level and the ability to be able to walk uphill and on uneven and rocky ground. Please ask us about this further if you need more clarification. Again, this is an adventurous, bespoke retreat and as such, this is a limited group only. Speak to us about single rooms if you prefer. Confirmation of your place is guaranteed only by payment of the non-refundable deposit. Your place is not secured until this deposit is paid. ALL INCLUSIVE PRICE: from $A 6495 twin share (international airfare not included). Single Room Supplement $1695. Deposit is $A1500 to hold your place. FREQUENT RETREATERS BONUS! If you have been on any of my retreats before, you will receive a bonus discount of $A200 off the price! Learn the practical basics of REAL magic with Stacey Demarco. Learn why and how spells work in real life. Learn about magical timings and the role of the lunar and seasonal energies. Find out what you should NEVER do in spellcraft. 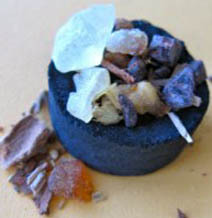 Cast a number of spells that really work in assisting you to make positive change in your life. Learn how to shield and ground. And have fun with like-minds! Many experienced witches have started their path in this workshop! All magical supplies, textbook and notes are included. No experience necessary. This is a level 1 workshop. STRICTLY LIMITED NUMBERS: call 0400 345113 or email: bookings@themodernwitch.com for further info and bookings. $185 – including all magical supplies, textbook and notes. This is a workshop covering some of the key skills in magical witchcraft. Mix your own potion with herbs, oils and essences and learn how to connect it to spellcraft successfully. Sew, stuff and enliven a poppet. Learn what curses are and how to protect yourself – prevention! Learn how to diagnose and the process of curse reversal. You will be provided with lots of herbs, oils and goodies to get practical on the day! Notes will be provided and you’ll be taking home what you make! This is a level 2 workshop. This is only for people that have basic or intermediate witchcraft knowledge and are practicing and casting. This is not a complete beginners workshop. If you have completed “Discovering Witchcraft”, this is the minimum. If in doubt, contact us. $185 – SMALL NUMBERS ONLY so please contact us now to book. Bookings or information email: bookings@themodernwitch.com or call 0400345113. There are places in the world so beautiful, so mythic, that writers and artists, both ancient and modern, create whole works around them. There are places on the planet that allow us to unfurl our wildness and seek our own courage and bravery once again amongst their profound beauty. There are places where power animals still walk and SEE you within their own realms. There are places where Goddesses still live and where they inspire us to let go of the burden of the everyday. This adventure will take you deep into such places. 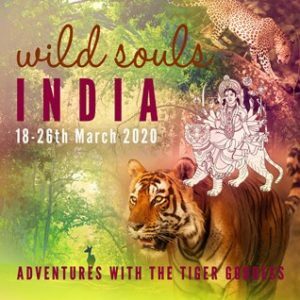 Wild Souls India will be centred around taking authentic safaris into two of India’s most stunning national parks, Kanha and Bandhavgarh, in search of the Royal Bengal Tiger. The tigers have special power and significance in Hindu and Indian culture, and the Goddesses Durga (She who rides the Tiger) and Kali-Ma are specifically aligned with these rare and mysterious animals. Both parks are outrageously beautiful and you will have the best naturalist guides to explore them with you. You’ll also be staying in fantastic accommodation that reflects the area and gives you a point of luxury to balance out all that hard-core jungle! After meeting in Delhi, we will fly into Raipur and then drive to Kanha. Kanha National Park is pure “Jungle Book’ territory, and is where Rudyard Kipling found his inspiration for his famous work. Yes, here is Shere Kahn territory, with high densities of tigers and the ability to spot animals that are found nowhere else. Kanha boasts of about 38 species of mammals. Some of the inhabitants of this park are the gaur, the largest of the world’s cattle; the sambar, the largest Indian deer; and the chausingha, the only four-horned antelope in the world. Other frequent visitors include the Nilgai antelope, the sloth bear, the dhole, or Indian wild dog, and an occasional Leopard. Some 300 species of birds inhabit the park, that includes the storks, egrets, black ibis, raptors, owls, and the red- wattled lapwings. Kanha is located right in the heart of India, and is a quieter area which also gives you an opportunity to experience the rural, tribal, and agricultural parts of India- the true India. After spending 3 nights in Kanha, after our morning safari and lunch we depart by road for the magnificent national park of Bandhavgarh where we will also spend 3 nights. As well as world famous tigers, other wild attractions in the park include Leopards, Blue Bulls, Indian Gaur (Bison) Chausingha (Four Horned Antelopes), Spotted Deers, Sambar Deer, Wild Boar, Sloth Bears Fox, Jackals, Wild Dogs, etc. There are at least 22 mammal species and about 250 bird species in the Park. There are also Ratel, Porcupine, Small Indian Civet, Palm Squirrel, Lesser Bandicoot rat, the Jungle Cat, and the shy Hyenas. The reptile population in the park includes Cobras, Kraits, Vipers, Ratsnakes, Pythons, Monitor Lizards and turtles. The two primate species – the rhesus macaque and the Hanuman langur are seen and heard! Bandhavgarh has been a centre of human activity and settlement for over 2000 years, and there are references to it in the ancient books, the Narad-Panch Ratra and the Shiva Purana. We will have the opportunity to walk to local villages and experience the culture here. Both areas are rooted deeply in mythos. We will do ritual and workings in each. For example” the fort in Bandhavgarhwa is said to date back to the mythos of Hanuman and Rama from the Hindu sacred epic the ‘Ramayana”. The mythos tells of the two monkeys that created the setu (bridge) between India and Lanka to vanquish evil demons, built the protective fort here. We will then travel back to Delhi for our farewell celebration and the next day, we have a morning tour of the city and will visit a Durga temple for a final blessing. Our service to you ends after the tour on the 26th. What’s included in your Wild Souls India experience? 2 nights accommodation (1st and last night) in the very cool Roseate House in New Delhi. 3 nights accommodation at the Singinawa Jungle Lodge. Kanha. This is a true safari-style lodge geared up specifically to support explorers. It is luxurious and bespoke with a 1,000 square foot museum onsite which is an ode to the spectacular work of the local indigenous Gond and Baiga artisans. In between our safaris and sessions, swim in the pool, book a spa treatment, go for a walk with a naturalist- it’s all available here. 3 nights at the Bandhav Villas, Bandavgarh. This is a carefully designed, highly authentic 5-star safari lodge. Again, a venue geared up to support your adventures but the kind of place you can return home to muddy and dirty from your safari and then delve into some luxury. Weather permitting, we will eat dinner under the stars one night and tell stories around the fire. – Your Meals: Nourishing meals from our first evening in Delhi through to our last breakfast back in Delhi are included. Our meals will reflect the cuisine of the areas we travel within and please discuss any specialised dietary requirements with us. As always on a Wild Souls Retreat, we immerse ourselves with the natural environment and the people who live there. As we will be travelling to jungle environments that are remote and deeply mythic, we have the services of some experts and naturalist guides who will assist us to get the most out of our visit. – We start with a welcome dinner and briefing in the modern Roseate Hotel in Delhi. Please book your flights to be present for this event. – We will be on safari almost every morning and night whilst in the parks (weather permitting). For those that haven’t experienced safari life, you are in for a treat! Days start early normally around dawn, with a chai, tea or coffee and snack and we journey into the park in our jeeps. Here our naturalist experts will guide us through the jungle in search of tigers, leopards and other amazing wildlife and birdlife. You will soak in the power and beauty of the area! Dependant on the park, we will normally have breakfast as a picnic out in the wilderness. After the morning safari we will come back to our lodge for lunch and leisure time. We may have an activity planned or a teaching or meditation with Stacey. As the light begins to change, we will go out into the park again for the late afternoon safari. Many animals come out to hunt at dusk and we get our chance to see these animals here. Again, we are in the hands of expert guides who know the local area intimately and who will give us the best chance of spotting wildlife. At sunset, we travel back to our lodge, swapping photos and stories and get ready for dinner. Dinner may well be outdoors under a night sky clear of outside light sources and amongst the chorus of nature. A beautiful in-depth spiritual programme with Stacey designed to inspire you, connect you with your healthy fierceness and open your heart to your wilder self. Sometimes, the world can make us feel very small- the tiger goddesses help us wake up to our power! Every day you’ll learn something new – whether it will be through the power of nature as teacher, sessions with Stacey or the local people, or through the specific strength of the tiger goddesses. Return transfers from the hotel on the last day to the international airport should you wish it. Please also note, we will never support animal cruelty or poor safari etiquette. Our local guide supplier and our Wild Souls group will not involve themselves in activities like elephant back safaris or tours involving captive or caged animals. We advise you not to include these activities on your own personal activities if you are staying on longer in these areas. As always, you will be supplied with a packing list and further details well ahead of time and of course the useful and beautiful gifts you have come to expect. This retreat requires an average fitness level and the ability to be able to walk on uneven ground. Please ask us about this further if you wish. Again, this is a remote, bespoke retreat and as such, this is a small group only. We are able to secure a very small number of single rooms but so please ask us early. Confirmation of your place is guaranteed only by payment of the non-refundable deposit. ALL INCLUSIVE PRICE: $A4440 twin share (international airfare not included). Deposit is $A1250 to confirm your place. FREQUENT RETREATERS BONUS! If you have been on any of my retreats before, you will receive a bonus discount of $200 off the price. Special Early Bird Bonus: If you pay your deposit before 31st March 2019 you will receive a discount of A$100.